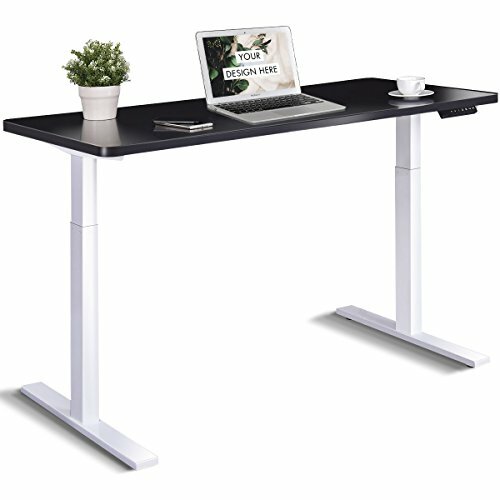 Our standingtable is a good choice for you indulging in your own world. Concise style andpremium performance clear demonstrate its noble quality and non-negligible incredible appearance, which can easily sparkyour passion to work and study. Adjustable legs, which can meet your idealdemand of height, can become higher or lower just in one press. The quiet operationwill also win the applause from you and surprisingly, its stability will neverfail you expectation and maximize your productivity. As a neck & spine painkiller, it promotes you a better posture and brings you a better health. Thesturdy body with rust-resistant metal construction can stand for the test of time.With all the advantages it owns, it features a wonderful helper in your house.It can perfectly fulfill your purpose. Don't hesitate to buy it now! ☆SPACIOUS DUAL MOTOR DESK: With a total size of 55.5x26" (LXW), it can perfectly accommodate your laptop or computer and various supplies can also be allowed to place on it, giving you a large working area. It also equips with 2 motors and lifts or falls with "1" increments rapidly and quietly. ☆CREATIVE LIFT SYSTEM: The sit-stand office desk can be adjusted vertically from 27.5'' to 46.5" to meet your different demands of desired height, just lifting it effortlessly. And the stability will also be guaranteed while adjusting. It comes with LED view screen, which tells accurate height and easy to operate. ☆RELIABLE PERFORMANCE: It is widely applied in office or home as a perfect work station for its spacious work area. Its efficient operation system allows you to use it whenever and wherever you need. Constructed with a sturdy body and smooth desktop, it can be cleaned quickly and easily stand for the test of time. ☆ERGONOMIC USING ADVANTAGE: Reasonable height difference with desktop keeps your shoulders and neck relaxed, which enables you kill the neck strain and shoulder pain. You can work standing or sitting throughout a day wiping out tiredness and sparking your working inspiration. ☆MEMORY PRESET CONTROLLER: The innovative design of its memory preset controller is easy for you to grasp and handle. There are 4 preset buttons to customize your desired heights. You can set your favorable height with a sound notice and memory it with one preset button. You can just press it to get the ideal height instead of making effort to adjust.